As Health Apps Hop On The Apple Watch, Privacy Will Be Key : All Tech Considered The notion of receiving nutrition advice from artificial intelligence on your wrist may seem like science fiction. But health developers are betting this kind of behavior will become the norm. One day soon, you may be waiting in line for a coffee, eyeing a pastry, when your smart watch buzzes with a warning. 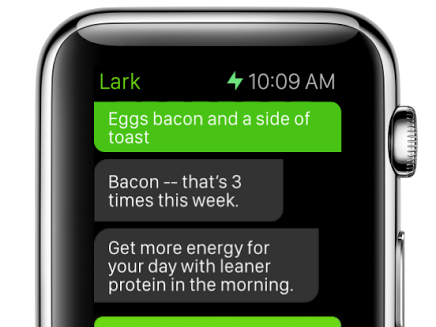 Flashing on the tiny screen of your Apple Watch is a message from an app called Lark, suggesting that you lay off the carbs for today. Speak into the Apple Watch's built-in mic about your food, sleep and exercise, and the app will send helpful tips back to you. The notion of receiving nutrition advice from artificial intelligence on your wrist may seem like science fiction. But health developers like Lark are making a bet that Apple's first wearable device, the Apple Watch, will fly off the shelves and this kind of behavior will become the norm. Lark is just one of over a dozen health developers with new apps for the Apple Watch, which ships to consumers this week. These apps range from medication management to a button that provides instant, virtual access to a doctor. Apple has made no secret of its health and fitness plans for the Apple Watch. And in recent months, it has recruited medical experts to work on services like ResearchKit and HealthKit, which aim to open up the flow of health data between consumers, mobile developers and medical researchers. But is Apple doing enough to protect the privacy of your sensitive health data? In advance of the Apple Watch's release, the company has taken some steps to put you in control of how your data is shared. You can choose to share health information with third-party apps like Lark via Apple's Health app, which comes with the device. Your health data, collected via the Apple Watch or the iPhone, is stored on Apple's HealthKit. "Apple is leaving your HealthKit data on the device and not collecting it," said Morgan Reed, executive director at The App Association, a Washington, D.C., nonprofit that works with patient advocates and app developers. According to Reed, this prevents third-party app developers from selling your health data without your consent. "It also means that if an employer wants access to your health care information, they would have to demand that you give it to them," he said. But it's still early days for the Apple Watch, and it remains to be seen whether health developers will follow Apple's privacy guidelines. "We haven't had a developer ecosystem for a product like a smart watch," said Ben Bajarin, who specializes in consumer technology for Creative Strategies, a consulting firm. "This is [uncharted] territory." Health app developers hope the Apple Watch will improve how doctors and patients communicate. Imagine a doctor receiving a buzz on the wrist for an e-prescription request, which could be approved with a few taps. A patient could receive a similar alert when test results are available. Developers are exploring these possibilities and more. "We are predisposed to small changes on the skin. It was not that long ago — and is still the case in parts of the world — that mosquitoes used to kill us with a light touch," said Ron Gutman, chief executive of HealthTap, a website and mobile app for secure video calls with a doctor. "It is so easy to turn off a notification from a website, but you can't ignore what's on your wrist," he said. Gutman was so intrigued by Apple's smart watch that he developed three apps: one to help you manage your meds; another that connects you to a doctor with the touch of a button; and a third, which helps physicians reach new patients. "Be prepared to take charge of your health information, and feel free to say no to sharing data with apps." For patients who are juggling a variety of meds — all with different dose requirements — an Apple Watch app that sends alerts to the wrist could prove useful. WebMD, used by millions of people to check their medical symptoms, tossed around a bunch of ideas before settling on medication adherence. "All we wanted is for the user to be reminded that it's time to take their medication, and then quickly tell us whether they plan to take it or skip it or snooze," said Ben Greenberg, who heads up WebMD's mobile products. "That interaction demands so little." The app also instructs people whether to take their medication with food, or at a certain time of day. Other companies that are developing medication adherence apps for the Apple Watch include MangoHealth, which can also tell you how well you've managed your prescriptions over time, and pharmacy giant Walgreens. Some app developers hope that doctors will flock to buy the Apple Watch to help them manage an overload of patient information. "Doctors are finally getting amazing hardware that just works, and they're willing to pay a premium for it," said Daniel Kivatinos, cofounder of Drchrono, an electronic medical record company. Using Drchrono's app for the watch, a doctor can receive alerts, such as when a patient has arrived at their office. The watch could prove useful in helping doctors communicate with each other about tricky medical cases. Doximity, the Facebook for doctors, has developed a secure app that care providers can use to dictate notes, send messages and receive notifications that a fax has arrived. But the Apple Watch's appeal may be limited to certain specialties, such as family physicians and dermatologists. Surgeons routinely remove their rings and watches before procedures, to ensure their hands stay sterile. Moreover, doctors will need to do the work to ensure that apps they use are taking adequate steps to protect patient data. Apps may say that they are meeting privacy requirements, but most aren't properly vetted. The government has long been concerned about the proliferation of mobile health apps that make false or misleading medical claims. Privacy experts and policymakers have been worried about developers that collect and sell personal health information. The U.S. Federal Trade Commission concluded in a recent study that developers of 12 mobile health and fitness apps were sharing user information with 76 different parties, such as advertisers. Apple has responded to some of these fears by barring developers from selling health data that it collects via Apple devices to advertisers. After some high-profile hacks to celebrities' accounts, Apple also forbade developers to store sensitive health information in iCloud. "Apple has clear privacy rules, but consumers should still be on guard," said Reed from the App Association. "Be prepared to take charge of your health information, and feel free to say no to sharing data with apps."